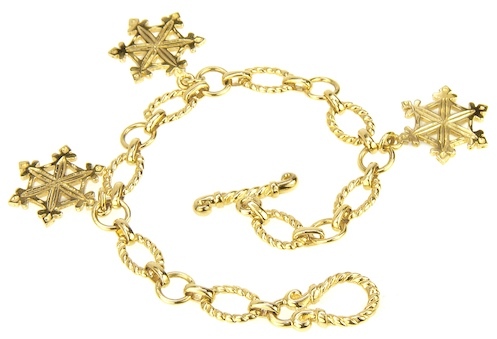 Our whimsical Wonderland Snowflake Charm Rope Style Toggle Bracelet is featured here in 14k yellow gold and is the perfect addition to your holiday season. For a anyone who loves snow, snowflakes and the winter season it makes for a great gift at this fantastic clearance sale price. 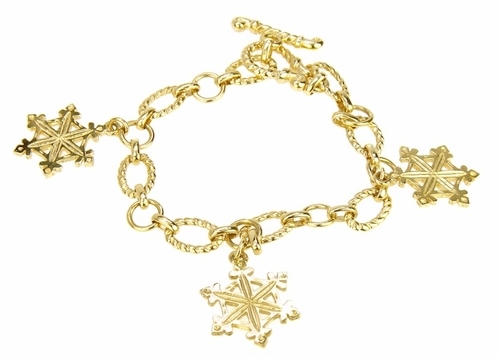 Three 14k yellow gold snowflake charms adorn this fashionable bracelet that secures with an integrated toggle clasp system. You can even turn this into a charm bracelet by adding personal charms of choice from your collection. The oval connector links have a twisted rope style design that will beautifully accentuate your wrist and add a wonderful design element to this piece. 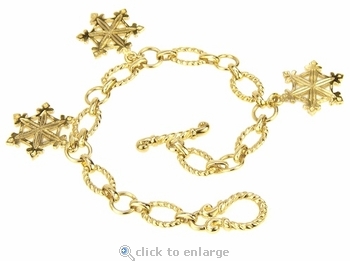 The bracelet measures 7 inches in length and each charm measures approximately three quarters of an inch in diameter.